What quest? I can not find it.
.:: Vengador Sow Potions :: Explayer of Everquest I :: Servers: SZ (pvp) StormHammer Legends (pve) ::. 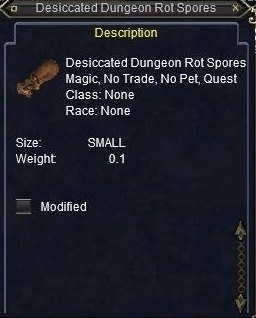 They're misleading, and probably not used in any quest, but implied for The Dungeon Rot Infected quest. These drop off the Dungeon Rot mobs in Howling Stones, but can't be used for the quest.